found in many mining applications. These and other operating factors require that wire ropes be properly lubricated to provide long rope life and maximum protection against rope failure where the safety of people is involved. A wire rope consists of several strands laid (helically bent, not twisted) around a core. The core can be a rope made of hemp or other fiber, or may be an independent wire rope or strand. Each strand consists of several wires laid around the core, which usually consists of one or more wires but may be a small fiber rope. The number of wires per strand typically ranges from 7 to 37 or more. A number of factors contribute to the need for proper lubrication of wire ropes. Each wire of a wire rope can be in contact with three or more wires over its entire length. Each contact is theoretically along a line, but this line actually widens to a narrow band because of a deformation under load. As load is applied, and as a rope bends or flexes over rollers, sheaves, or drums, stresses are set up that cause the strands and individual wires to move with respect to each other under high contact pressures. Unless lubricating films are maintained in the contact areas, considerable friction and wear result from these movements. One of the principal causes of wire rope failures is metal fatigue. Bending and tension stresses, repeated many times, cause fatigue. Eventually, individual wires break and the rope is progressively weakened to the extent that it must be removed from service. If lubrication is inadequate, the stresses are increased by high frictional resistance to the movement of the wires over one another, fatigue failures occur more rapidly, and rope life is shortened. Another principal cause of rope failure is corrosion. This covers both direct attack by corrosive materials, such as acid water that may be encountered in mines, to various forms of rusting. To protect against corrosion, lubricant films that resist displacement by water must be maintained on all wire surfaces. Wear, deterioration, or drying out of the core result in reduction of the core diameter and loss of support for the strands. The strands then tend to overlap, and severe cutting or nicking of the wires may occur. The lubricant applied in service must be of a type that will penetrate through the strands to the core to minimize friction and wear at the core surface, seal the core against water, and keep it soft and flexible. During manufacture, wire rope cores are saturated with lubricant. A second lubricant, designed to provide a very tenacious film, is usually applied to the wires and strands to lubricate and protect the wires and to help keep (seal) the lubricant in the core as they are laid up. These lubricants protect the rope during shipment, storage, and installation. Much of the core lubricant applied during manufacture is squeezed out when the strands are laid, and additional lubricant is lost from both the core and strands as soon as load is applied to a rope. As a result, in-service lubrication must be started almost immediately after a rope is placed in service. Proper lubrication of wire ropes in service is not easy to accomplish. Some of the types of lubricants required for wire ropes may not be easy to apply, and often wire ropes are somewhat inaccessible. Various methods of applying lubricants are used, including brushing, spraying, pouring on a running section of the rope, drip or force feed applicators, and running the rope through a trough or bath of lubricant. Generally, the method of application is a function of the type of lubricant required to protect a rope under the conditions to which it is exposed. These requirements necessitate some compromises. 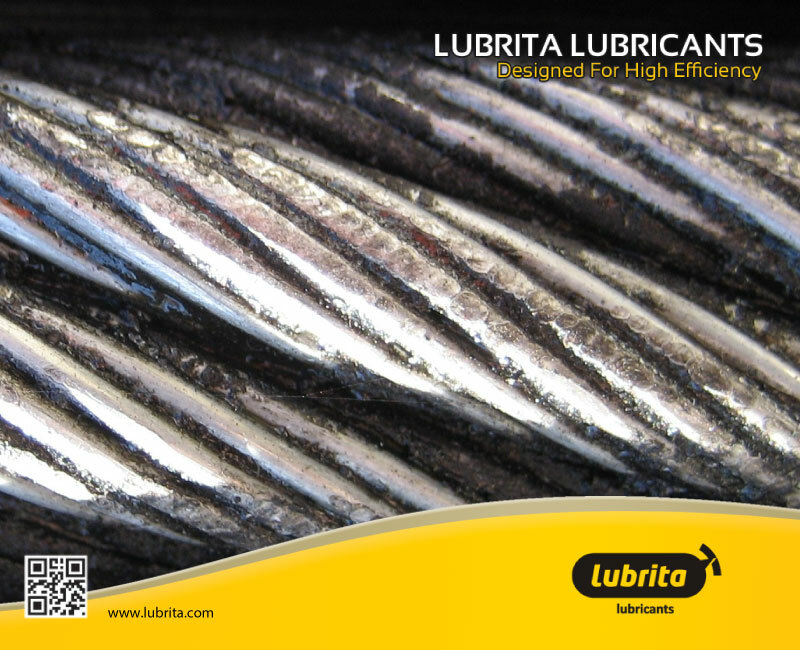 Wire rope lubricants may be formulated with asphaltic or petrolatum-based material and contain rust preventives and materials to promote metal wetting and penetration. Diluent products are used in some cases for ease of application. Grease products containing solid lubricants such as graphite or molybdenum disulfide are also used. The challenges with greases are the ability of the lubricant to penetrate to the inner core strands and its attraction for dust and dirt buildup. Wire ropes are often used in applications operating near or on an ocean, bay, river, lake, or other waterway, and as a result require environmentally acceptable wire rope lubricants to minimize their impact on the environment. Please contact us for Your application needs and our technical support team will give You the best lubricating solution!